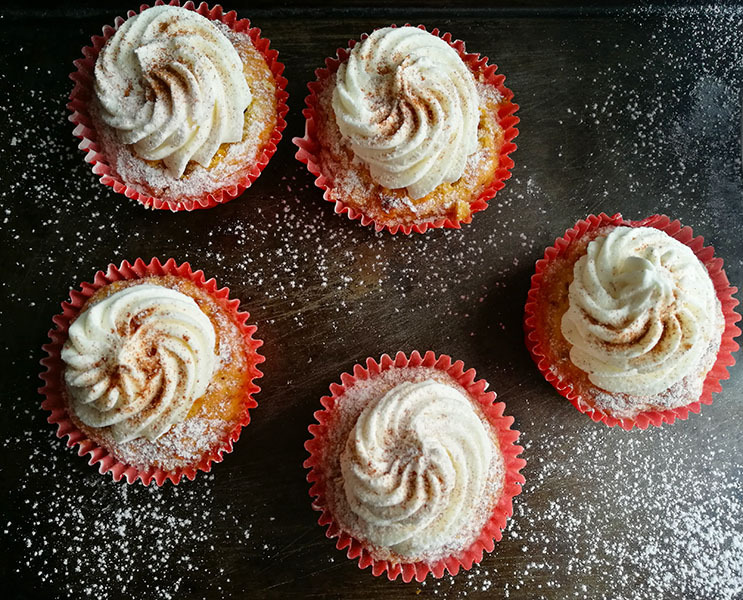 These egg-free, moist and soft One Bowl Carrot Cupcakes topped with a silky vanilla buttercream frosting is about to become your new favourite bake. No special equipment is needed here. The cake batter is mixed in one bowl, using just a whisk or a fork. Easy and delicious!!! 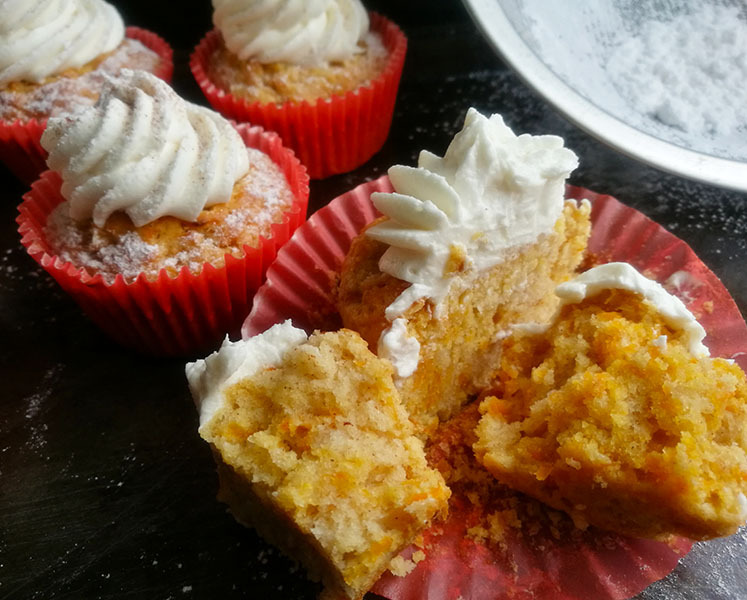 These One Bowl Carrot Cupcakes are made with simple and basic ingredients, which you might have in your kitchen right now. 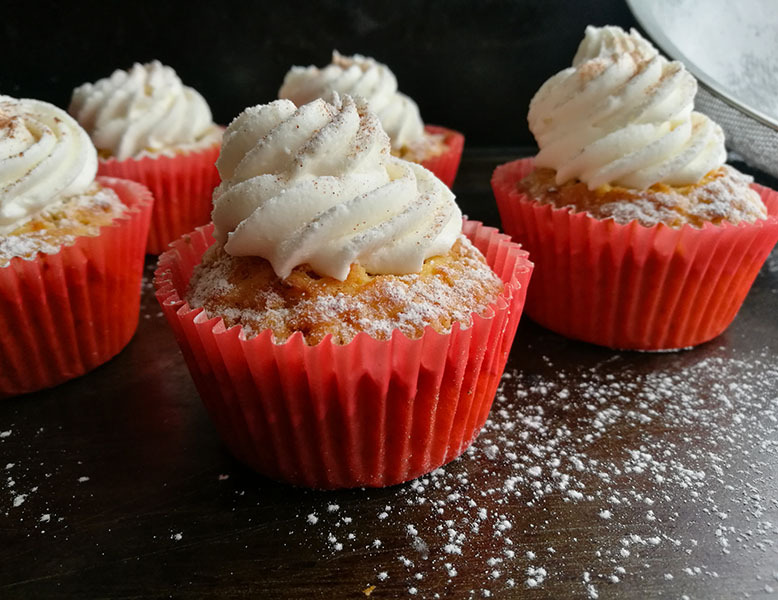 Instead of the cream cheese topping which you will usually find with carrot cake recipes, these cupcakes are topped with delicious vanilla buttercream. This will make a great bake, especially if you are serving at a party or transporting them to another venue. That’s because, since we are using buttercream, you don’t have to worry about the cream cheese getting soft and runny. You will notice that there is brown sugar as well as white granulated sugar in this recipe. The brown sugar helps add more moisture to the cupcakes and also enhances the flavour. So try not to leave out this ingredient as it does contribute to the texture and flavour of the cupcake. Raisins and pecans or walnuts have not been added to this recipe, because I really wanted to keep it simple, and still have the great flavour. However please feel free to add it into the batter if you prefer. Super easy to make, In a large bowl, the flour, baking powder, salt and cinnamon powder are mixed together with a whisk or fork. Add in the melted butter, milk and vanilla and mix well. The mixture might look dry now, but do not worry, because when you add the grated carrots, it will provide more moisture to the batter. Using a spatula or spoon, fold in the grated carrots. As you fold in the carrots you will see and feel that the batter now has more moisture. Fill the cupcake paper cases up to ¾, using an ice cream scoop or spoon. Bake in a preheated oven of 356°F / 180°C for 15 to 20 minutes, until a skewer or toothpick inserted into one of the cupcakes, comes out clean without any batter clinging to it. Remove from the oven and place the cupcakes on a wire rack, and allow to cool completely before topping with the vanilla buttercream. Using a handheld beater or whisk, beat the butter for about 2 minutes. Slowly add in the powdered sugar/icing sugar and vanilla extract and mix well, until the mixture is light and fluffy. Pipe or spread the buttercream over the cooled cupcakes and add a sprinkle of cinnamon powder if you like. 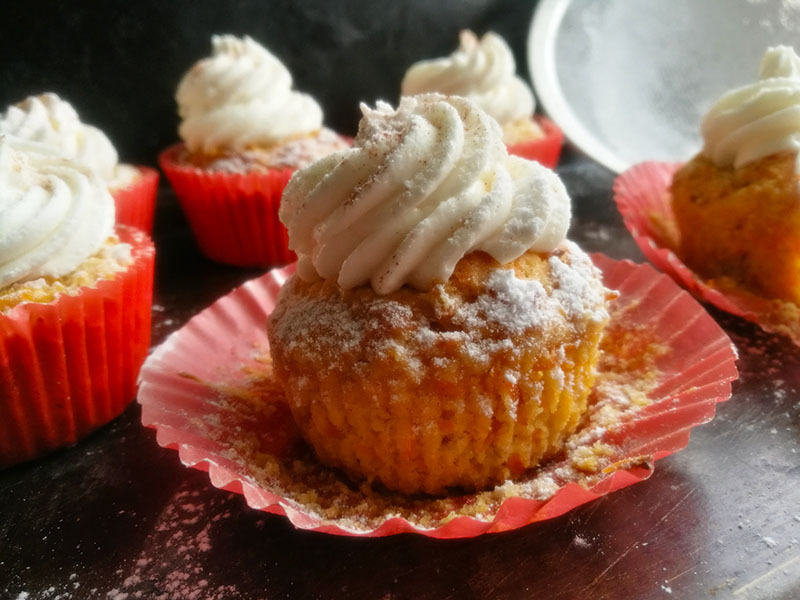 A little cupcake with incredible flavour, this is one bake that you are going to love. These egg-free, moist and soft One Bowl Carrot Cupcakes topped with a silky vanilla buttercream frosting is about to become your new favourite bake. No special equipment is needed, because the cake batter is mixed in one bowl, using just a whisk or a fork. Easy and delicious !!! In a large bowl, the flour, baking powder, salt and cinnamon powder are mixed together with a whisk or fork. Using a spatula or spoon, fold in the grated carrots. As you fold in the carrots you will see and feel that the batter has more moisture. I love a good carrot cake!! This looks so moist and just one bowl for all these cupcakes, I don’t have to get my stand mixer out. Loving these…. As I’ve said before Ashika your cake decoration is outstanding. And I’ve no doubt that they taste every bit as good as well as they look! So moist and delicious looking. Yummy! I love carrot cake! I just made one the other day and realized that I don’t make it often enough; I’ll have to try yours because I love how light they look! Ashika, these cupcakes look so delectable! 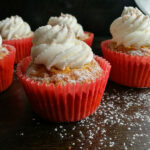 I love carrot cake, and in cupcake form, I’m imagining heavenly flavor! Perfect for Valentine’s Day, too!